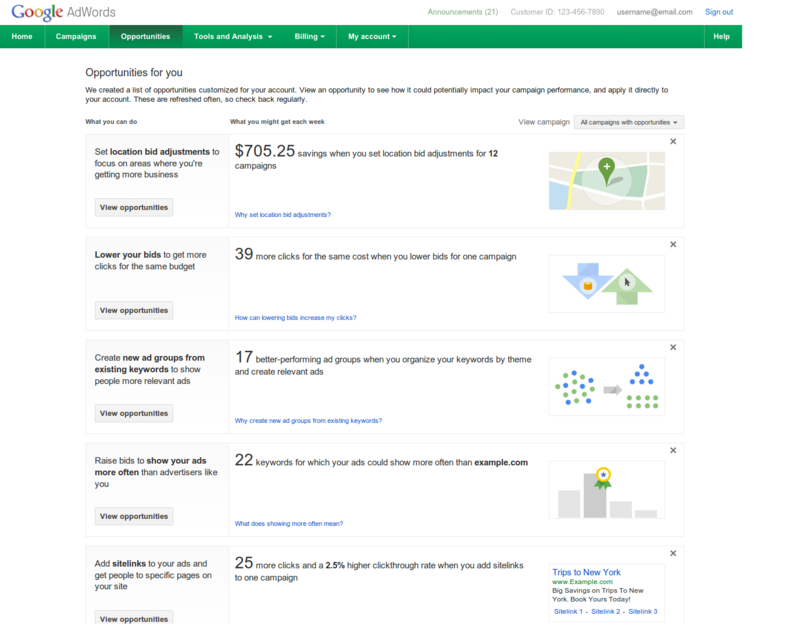 Google announced that after four years or so, they have upgraded the Opportunities tab or section within the AdWords interface. Google said this upgrade brings "several new opportunity types and made each easier to understand." Convert more customers in your best locations: If your conversion rate differs across locations, you might see opportunities to increase your location bid adjustment where your conversion rate is high, or decrease your location bid adjustments where your conversion rate is low. Get more out of your existing budget: If you’re maxing out your budget, you might see opportunities to lower your bids to capture more clicks. Be there more often than competitors: If your ads are being seen less frequently than other advertisers competing for the same traffic, you might see opportunities to be seen more frequently with bids to show more often than advertisers like you. Show ads that are more relevant: If we spot an ad group with keywords related to lots of different themes, it's harder for you to show a highly relevant ad, so you might see opportunities to create new ad groups from existing keywords. Reach more customers on closely related searches: If you're missing clicks on searches that are very similar to your existing keywords, you might see opportunities to broaden your keyword match types. Be seen on the first page: If your ads are showing below the first page when users search on high-quality keywords, you might see opportunities to raise your bids to show ads on the first page.